3 - 5 5% $21.81ea. 6 - 9 10% $20.66ea. 10 or more 12% $20.20ea. Great balls nothing bad to say other than the wind really messes with them and when using them on the field for ground balls they stop very suddenly. Absolutely no reason to buy/ use any other ball in the JLF pitching machine. I was concerned about their function, but these work just like baseballs without the hurt. Great for catching drills also. 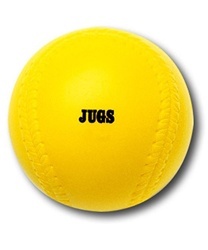 while these balls are for the lite flite pitching machine, they are excellent balls to use for training young fielders without having fear of taking one in the face. the balls are very light, yet throw and fly very well.